We present a case of acne inversa Hurley clinical stage II, to a 28 year-old patient non-obese, smoker, with a long history of firm nodules, large abscesses and sinous tracts, small scars, distributed in the axillary, groin, perianal and infraumbilical areas, associated with lesions on the face. Any therapeutic schemas ( antibiotics, Isotretinoin orally, Dapsone, UVB,cryotherapy) was unsuccesfully and we sent the patient to Surgery Department for wide excisions. Prezentujemy przypadek trądziku odwróconego w II etapie zaawansowania klinicznego Hurley, u 28-letniego pacjenta bez otyłości, palącego papierosy, z długą historią guzków, du?ych ropni, przetok, małych blizn, zlokalizowanych w dołach pachowych, w pachwinach, w okolicy odbytu i w obszarach poni?ej pępka, związane ze zmianami na twarzy. Wszelkie schematy terapeutyczne (antybiotyki, izotretynoina doustna, dapson, UVB, krioterapia) był nieskuteczne, w związku z tym wysłaliśmy pacjenta do Oddziału Chirurgii celem opracowania chirurgicznego. Hidradenitis suppurativa (from the Greek hidros = sweat and aden = glands) is a chronic follicular occlusive disease involving the intertriginous skin of the axillary, groin, perianal, and inframammary regions. Acne inversa has a typical clinical picture: cutaneous and subcutaneous nodular nflammation, fistulae with malodorous secretion and scaring. It affects men and women, with an incidence between 1-4 %, with a peak in the second and third decade of life, with unknown pathogenesis but with well documented trigger factors: smoking (unclear mechanism), obesity (by maceration and occlusion in the body folds through follicular hyperkeratosis), positive family history and lately genetic backgrounds. 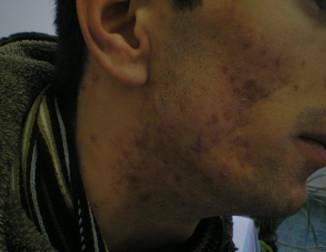 Acne inversa is today regarded as an inflammatory disease of terminal hair follicules and not a disease of appocrine glands  that can explain the influence of androgens in the course of the disease, its absence before puberty and some therapeutic results with anti-androgen, although the hormonal levels in all patients are within normal limits . 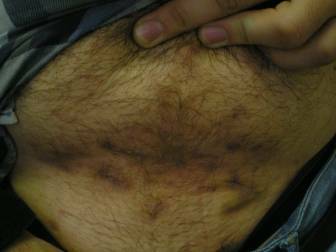 A 28 year-old patient non-obese, smoker, presented in our department, with a long history of firm nodules, large abscesses and sinous tracts, small scars, distributed in the axillary, groin, perianal and infraumbilical areas, associated with lesions on the face. No fever, but pains and pruritus and an important impairment of the quality of life (Fig.1,2). All the lab parameters were within normal limits, including androgen level. Based on clinical aspects: (recurrent abscesses with tract formation and cicatrisation, multiple widely separated lesions with bilateral distribution on specific areas) and on chronicity of the lesions, we established the diagnosis of acne inversa Hurley clinical stage II. We started immediatly Isotretinoin 20 mg/day increased after 2 months to 40 mg/day with a slight positive evolution in the first weeks of treatment, but with an agressive relapse 3 months later, we stopped the medication after 10 months. Based on the cultures performed from the axillary and anogenital regions which found Staphylococcus aureus, we introduced antibiotic therapy: Azythromycine, Ciprofloxacine and Oxacilline, but with no improvement. The next step was the treatment with Dapsone 50 mg/day ,which was also discontinued after two months, for the absence of any therapeutical answer. Strictly on the lesions, on small areas, we performed cryotherapy interrupted because of pains and later UVB 311 nm with no results. So we are in front of a patient with a long history of acne inversa, not responding to treatment after one year of trying different therapeutical approaches. Patient refused any other conservative therapy (such as TNF alfa antagonists or Methotrexat) and decided to accept the surgical treatment: wide excision of lesions in healthy tissue (lateral and deep safety margins). We sent him to the Surgery Department. The particularity of this case was our fail of therapy and finally the decision to send the patient to Surgery. 1. Meixner D, Scneider S, Krause M, Sterry W: Acne inversa. JDDG; 2008; 6: 189-196. 2. Fitzsimmons JS, Guilbert PR: Evidence of genetic factors in hidradenitis suppurativa. Br J Dermatol 1985; 113: 1-8. 3..Lukowsky A, Sterry W, Sneider-Burrus S: Prevalence of the Mspl and Ile 462 ValSNPs of Cytochrome P-450 1A1 in Hidradenitis Suppurativa Exp Dermatol. 2010; 19:541-542.